B.J. Hollars is the author of two books of nonfiction, Thirteen Loops: Race, Violence and the Last Lynching in America—the 2012 recipient of the Society of Midland Author’s Award—and Opening the Doors: The Desegregation of the University of Alabama and the Fight for Tuscaloosa forthcoming from the University of Alabama Press. His short story collection, Sightings, is forthcoming from Break Away Books/Indiana University Press. He has also served as editor for three anthologies: You Must Be This Tall To Ride: Contemporary Writers Take You Inside the Story, Monsters: A Collection of Literary Sightings (Pressgang, 2012), and Blurring the Boundaries: Explorations to the Fringes of Nonfiction. An assistant professor of creative writing at the University of Wisconsin-Eau Claire, he lives a simple existence with his wife, son, dog, and their books. It’s amazing how the smallest things can have the greatest impact on us. Something as simple as a friend moving can cause someone to begin to question the world around them. Too often people assume the grand things in life are what affect us the most, which may be true, but this post shows that the “velcro shoes” of a person’s life may just be enough to change perspective. I think we all can relate to that first childhood heartbreak, whether it be romantic or platonic. The one that leaps to mind for me is my first grade (and overall first) crush, Ryan. I wrote dumb poems about him, and though I wasn’t confident enough to think I had a chance, let alone the courage to say how I felt, there was still that childish certainty that we’d be together. We drifted apart in second grade, naturally. I couldn’t agree more. I, too, had suffered a childhood separation of my best friend (but this time I was the one moving, and nothing could be done to make my parents turn the car around, away from the dusty Arizona highway, the cacti and the desert). I love the blog post, and the essay from issue 10. It really is a great line that teaches a relatable and valuable lesson. Glad you enjoyed the post! “Breconshire Drive,” for me represents more than just an essay, which I truly enjoyed by the way along with Hollars’ blog. It made me reflect and cherish the invaluable time in which young friendship once thrived in my life. Children’s cohesive bonds are vulnerable to decisions not made by them, whether it’s economical, marital, etc. “We don’t stop smashing until the last of those writhing bodies turns to jelly,” the life and death, mortality, has me thinking about the power, one’s control over life, that goes to a child’s mind when he/she toys with inflicting death onto animals such as ants. When I had pulled out the magnify glass on a sunny day, was I just a child playing or was I God for a moment? Thank you Sega and Nintendo with two-player games for letting me share the distractions of my childhood thereon after! Does a parent’s choice to move outweigh a child’s friendship? Hollars makes his antagonist much more ambiguous, not being the parent’s choice; his essay makes me think that if it wasn’t the move, something else would’ve torn the friendship. Very interesting take on the essay, Abner! I’m always fascinated where nostalgia and old memories take the mind. Do you have an example of where nostalgia has taken your mind, Bianca? This essay is such a beautiful representation of friendship and life in the eye of a 7 year old. For a 7 year old the most important thing in their lives is friendships and learning. I feel like that is something that we as people need to get back too. We always worry about work, or problems in relationships, how close our phone is to us and picking it up as soon as it rings. The beauty of this piece is that B.J. Hollars allows his readers to remember and reconnect to their childhood through one of his own memories. Great thought Chelsea. Sometimes it really would be great to just slow down for a bit and appreciate the small things the way we did when we were young. Glad you enjoyed the post! This story brings back so many childhood memories. The world just keeps moving on for all of us, it seems. I have reconnected (thank you internet!) with some of the people I shared those years with, and we have an amazing time reminding each other of our trials and adventures. They look so different through the adult eye, so precious now. It’s always a pleasure to reconnect and rekindle old memories. Great thought! I remember the first time I moved out of one childhood neighbourhood and into a new one. A few years later, I was on my own and tried to go back to where I grew up. There is definite truth in the saying, “You can never go home again.” Once that childhood home is left behind, or that friend moves on, there’s just no going back and making it right again. In some ways it’s depressing. But in other ways it’s a nice reminder of how far we’ve come. It is a feeling that is very relatable for almost everyone. Great thought! “Kill my umbrella tree, I begged to a God I’d never met. Just promise me you’ll blow up Michigan, too. This is such a beautiful, heartbreaking thought – and so truthful. Even beyond childhood, I sometimes find the world’s ambivalence jarring. It also creates dear, fleeting moments though. Thanks for sharing this and your lovely “Breconshire Drive” with us. I think we spend our lives out searching for those feelings of innocence and freedom. Thank you for sharing. 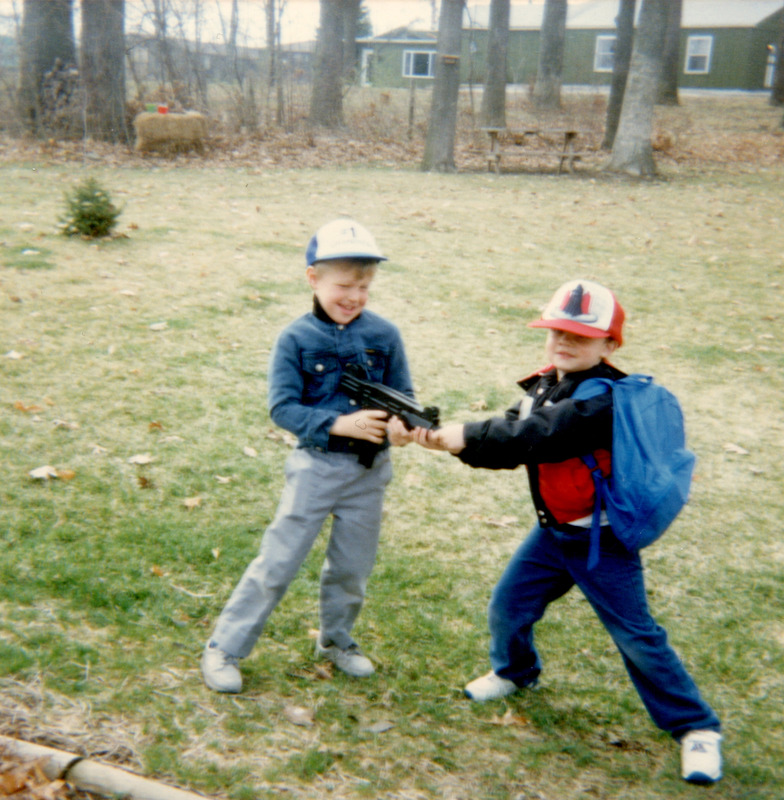 I especially enjoyed the photo of two boys being boys. I agree Gloria. And sometimes in searching for our feelings of innocence we need look no further than our memories. Glad you enjoyed the post! Amazing piece. Thank you for sharing. It is an amazing thing to learn that things aren’t all powerful and that no matter what we do sometimes things still won’t change. This had a lot of heart to it, very touching.